Today, my short story “Something Black” is published in Zen of the Dead, a Halloween-themed anthology by Popcorn Press. And I have to say, this has been the most whirlwind publishing experience I’ve had to date. The first week in October, I left my regular 9-to-5 at dusk and noticed a single crow sitting atop our building, emitting a lonely barrage of caws into the nearby canyon. On October 20, the solitary crow had turned into a murder of crows, sitting in a neat line in the exact same spot on the roof. It was exceedingly clear they’d conspired and exponentially increased their presence. A question leaped through my mind. What if that murder continues to grow? The question sent my head spinning and then inspired a follow-up question. Why would crows flock to a corporate building of all places? Because something supernatural and sinister is afoot, of course! During my commute home October 20, I dreamed up a story about mounting frustration, feeling invisible, and a murder (of crows). When I got home, I had an hour to write before my yoga class. I pounded at my keyboard and had a good three pages done before I had to bolt in time to namaste. Over the next 24 hours, the story begged to be written, and I couldn’t seem to type fast enough. By the following night, I had 17 pages of atmospheric, Hitchcockian horror written, edited, and sent out to first readers. On average, it takes me at least a couple weeks, if not a month, to write a story and polish it, so the experience was nothing short of exhilarating. The next morning, the fabulous Sara Dobie Bauer sent me links to a couple calls for submissions – both with super tight deadlines. I would need to send something within the next few days. Did I have anything to send? Strangely enough, I did. I gave “Something Black” a final read-through, formatted it for the publication, and emailed it to Lester Smith, founder of Popcorn Press, who was seeking horror fiction and poetry for Zen of the Dead. Not four hours later, I got a reply from Lester. “Something Black” had been accepted. And I didn’t know what to do with myself! Had I really written a story, sent it out for consideration, and been accepted within a span of 72 hours? To make this experience even more fantastic, Sara also has a story, “Auntie’s Favorite,” in Zen of the Dead. I’ve taken to calling Sara my cross-country writing soulmate, and this simultaneous publication simply affirms our weird, uncanny, wonderful bond. As always, it’s an honor to be published alongside her. 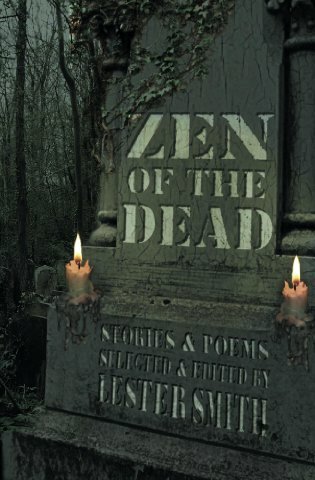 Today, the Zen of the Dead eBook is alive on Amazon and you can order a hard copy of the book via Popcorn Press’s website! I recommend you purchase your preferred form of book, curl up with a fall-inspired ale and a black cat under a bright, foreboding moon, and read some creepy Halloween-inspired fiction and poetry.